USCIB and the United States Council Foundation are delighted to announce publication of the Green Perspectives papers as a special supplement of the peer-reviewed journal, Energy Economics. The International Business Green Economies Dialogue (GED) worked with the editors of Energy Economics to identify respected authors to contribute their views and perspectives on a wide range of green economy topics of importance to society that are also particularly relevant to business. These include: green growth, green jobs, green energy, finance, economic development, consumer information and supply chain management among others, especially in the context of international policy and the global marketplace. We believe that individually and as a collection, these papers provide a major, foundational academic contribution to the field. Also, we are convinced that they can help to inform business and others as efforts continue to develop a greener, more prosperous world. that began early in 2011 as a process to create dialogue among governments, academics, think tanks, international organizations and business during the lead up to Rio + 20. Its overall goals were to enhance understanding of green economy issues and, through dialogue, to promote more effective policies and actions to restore economic growth and promote a greener economy. GED now enters a planned stocktaking phase to consider what we learned from the dialogues and papers, and to assess future directions and ways forward, especially in the international sustainability policy process. 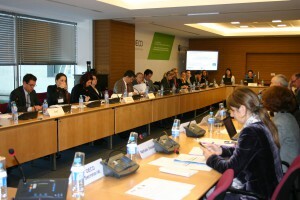 The first of these stocktaking sessions occurred this month at the OECD in Paris. We will endeavor to keep you informed on next steps. As the Green Economies Dialogue (GED) project unfolded in 2011, media focused on green growth in the context of government intervention to jump-start recovery from the economic crisis. Attention concentrated on desirable aspirational goals and opportunities to use green-growth policies to create jobs and stimulate the faltering global economy. At that time, only a limited academic, peer-reviewed literature existed that addressed emerging policy proposals concerning the green economy, green growth and green jobs. Consequently, some specific proposals and claims lacked fundamental economic and environmental foundations and analyses. To help fill this gap, the project cooperated with Energy Economics to invite respected scholars to contribute their peer-reviewed perspectives on green growth. The ten papers now appearing in the special supplemental issue of Energy Economics, entitled Green Perspectives, span a wide range of topics. They bring insights from mainstream economic and environmental analysis to bear on the fresh questions that arise in the context of the green economy. Authors’ discussions and insights are timely because green-growth and green-jobs proposals continue to figure in efforts to promote economic recovery and because the green economy was a major focus for debate on international priorities and actions at the recent Rio + 20 Sustainable Development Conference in June 2012. They will likely continue to be relevant in forthcoming U.N. discussions of new Sustainable Development Goals, and elsewhere. Overall, GED was designed to contribute to proactive interactions and dialogue between business, academics and those, especially in government, charged with negotiating, designing and implementing green programs and agreements. GED’s goal is to promote more effective understanding, policy and action to spur greener economic and social development. 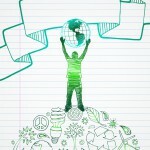 Green Perspectives contributes by providing documented, peer-reviewed professional economic insights and analysis. Additionally, a number of authors participated in GED dialogue events. In particular, in the lead-up to Rio + 20, GED sought to explore international as well as domestic aspects. Clearly, many of the most pressing environmental challenges confront poor developing nations most strongly. Many of these developing nations are also among the most important emerging markets for business. Green Perspectives papers contribute to international considerations regarding the scale and pace of change required to achieve proposed global goals and associated impacts on technology, investment and implications for financial transfers. These have significant importance for business in the context of both opportunities and challenges in globalized markets and from interactions between domestic and international regulatory frameworks. Going forward from Rio+20, the need to spur innovation and investment to meet the challenges of greener growth worldwide is clear. However policies to achieve this are proving to be complex and sometimes controversial. Consequently, as we found during Green Economy Dialogue events in Washington, Paris, Beijing and Brasilia, differences of view exist within society at large, within business and among nations about policies, timing and specific objectives. 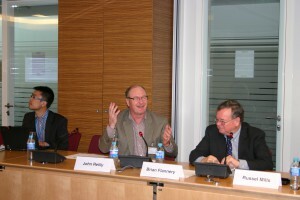 For example, creation and delivery of advanced technology and financial aid at the scale Rio+20 outcomes require raise serious financial and political issues, and differences exist over views on the motivation and ability of governments to create successful “industrial policy” to solve energy and environmental challenges. Moreover, some developing nations remain skeptical of green growth claims and intentions. GED organizers anticipate that publication of Green Perspectives will help inform and stimulate productive discussion going forward on effective ways to promote economic growth while improving the environment and enhancing social development. While Green Perspectives provide the authors’ (but not necessarily, it must be noted, the project sponsors’) views, they raise issues that require attention by everyone in the policy debate, especially business. Individually and collectively, these papers illuminate and underscore the enormous domestic and international political challenges ahead. In addition, they demonstrate the central role that business will need to play in the development, commercialization and global deployment of innovative, currently non-commercial technologies. GED sponsors extend their thanks and gratitude to all those involved in producing the Green Perspectives special supplement to Energy Economics. We hope that these papers will serve as an important reference for scholars and others long after the recent Rio Conference. Moreover, we believe that they can help to inform the ongoing debate on effective ways to improve the environment while advancing social and economic development. We intend to benefit from their insights as we remain engaged in international discussions to identify and implement practical and pragmatic options that work for business, government and society as a whole. From “Green Growth” to Sound Policies: An Overview, by Richard Schmalensee (MIT) makes an essential point that lack of clarity in green-economy concepts often inhibits effective discussion. While goals may be appealing to all, costs and benefits and distributional consequences remain poorly defined, ignored or simply asserted. Also, policies to promote desirable outcomes in one area may lead to unintended consequences in others areas of the economy, for example in jobs, investment and competitiveness. Without a doubt, economic opportunities exist (for example in energy and resource efficiency) that can enhance environmental outcomes. However, they do not appear to be available at the scale required to achieve proposed goals, most especially in the area of climate change. Also, as Schmalensee and other authors in the series convincingly argue: “green-growth” proposals do not inevitably lead to economic growth. He calls for more grounded, inclusive, thoughtful analyses and discussions to inform better choices that may garner more widespread support. Edmonds et al (Pacific Northwest National Laboratory Joint Global Change Research Institute) in Energy and Technology: Lessons Since Rio, describe the vast scale at which low carbon, low emissions technologies, many currently non-commercial, must be developed and deployed globally to stabilize greenhouse gas concentrations. They do not foresee a silver bullet: power, transport, agriculture, land use and other sectors will all require successful, ongoing innovation. Indeed, they stress that efforts will require decades, with even greater change in the 2nd half of the century. Also, they point out that affordable, advanced technologies become even more important in a mosaic world that does not adopt ideal approaches with complete global participation at a common carbon price. Carraro et al (University of Venice and Yale) in Investments and Public Finance in a Green, Low Carbon Economy provide results for the major shifts in capital investment that would be required in energy and other sectors. Their scenarios for emissions reductions, assuming a comprehensive, uniform, rising carbon tax in all nations, find a shift to more costly investments in the power sector and energy efficiency, accompanied by a sharp contraction of investments in other sectors. This change from more to less productive capital investment leads to a decrease in economic growth compared with the reference, non-intervention scenario. They also find that revenues from implied carbon taxes are very high (up to 20% of GDP in developing and resource rich nations) and potentially not politically viable. Finally, they note (as do Edmonds et al) that carbon sequestration through carbon capture and storage and land use changes becomes a major factor in emissions reductions. In many countries subsidies required for those actions significantly exceed income from a carbon tax. They highlight the need to better understand financial implications of such approaches. Richard N. Cooper (Harvard) in Financing for Climate Change discusses the scale and implications of wealth transfers promised to and expected by developing countries (hundreds of billions of dollars annually) that would raise major challenges for national competitiveness and the design of international institutions. Cooper describes challenges concerning how to marshal and deploy funds at this scale and whether such transfers will deliver desired outcomes with the efficiency typically assumed in academic models and discussions. He calls attention to the uncomfortable but all-too-real problems of rent-seeking and corruption in programs of this scale, and touches on the looming conflict between trade and climate regimes if countries try to apply border adjustments to exports and imports. In Greening Africa? Collier and Venables (Oxford) stress the need to account for national and regional circumstances and priorities in designing strategies for green growth. Using Africa as their example, they contend that approaches that may work in the OECD face steep challenges in poor developing nations. While Africa has significant potential for renewable energy, they argue that current capacity gaps and priorities make this an inappropriate, near-term priority. Despite the opportunity, lack of capital, management and governance skills make large-scale investments in renewables more risky and costly for Africa than for developed nations. They identify development of less costly fossil fuel resources, particularly for electric power as an essential enabler to underpin development and reduce poverty now. environmental externalities. He points out that economists have tools and metrics besides GDP that may better incorporate environmental factors in considering national economic growth and social welfare. He notes that GDP does, in fact, incorporate many (but not all) of the economic consequences of environmental impacts, e.g. on human health and agricultural productivity. Incorporation of non-market, environmental externalities involves important but complex concepts, and raises fundamental challenges for economic evaluation. These arise from many factors. For example, key impacts may not be discoverable in market transactions; changes occur over long periods of time requiring consideration of uncertain scientific and technical outcomes; and quantitative analysis requires imposing discount rates that are controversial and can dominate conclusions. Ultimately, progress achieving green growth will require better technical capabilities and political agreement on how to internalize green economy concepts in national and firm-level accounts. While energy-climate discussions highlight the positive role that business must play, Clean Energy: Revisiting the Challenges of Industrial Policy by Adele Morris et al (Brookings) speaks to the risks for poor outcomes when governments pursue industrial policy through politically appealing efforts to pick technology winners and losers and create jobs. They argue that economy-wide price signals provide a more flexible and effective approach than policies intended to advance particular solutions. They also point out fundamental flaws and challenges when politicians justify programs based on a desire to win the competition for jobs, e.g. for the USA to be number one in clean technology over China, Germany or Japan. The politically appealing objective to create domestic jobs in favored industries or places is often used to justify such targeted policy solutions. Particularly, at this time of economic challenges and high unemployment the prospect of support for green jobs has powerful appeal. The Elusive and Expensive Green Job, by Diana Furchtgott-Roth (Manhattan Institute) details the difficult challenge of actually defining green jobs, and the consequent risks for misallocation of public support based on poor and misleading metrics. She notes that all jobs have the potential to contribute to greener growth, and policies with poor design that focus on particular “green technologies” may have unintended consequences for growth, employment and economy-wide economic and environmental outcomes. Other papers address topics of more focused interest to business. Erica Plambeck (Stanford) provides case studies of efforts by two very different companies, Wal-Mart and Zeta Communities, to limit the carbon footprint of suppliers and products, respectively. She describes efforts by Wal-Mart to identify and incentivize opportunities in their supply chain leading to meaningful, economic reductions in emissions, especially in small and medium sized enterprises that may not previously have devoted attention to such issues. ZETA Communities implements a new business model, aimed at providing high efficiency components for entire buildings from a centralized source that can yield impressive improvements in final installed outcomes. Cohen and Vandenberg (Vanderbilt) consider the opportunity and issues involved in developing consumer information on carbon footprints as a tool to promote green outcomes. While methodologies for carbon emissions are far more complex, they argue that much can be learned from experience with current eco-labels. In particular, they argue that assuring credible certification is essential for communication with consumers, and that a uniform global approach would be desirable, possibly based on non-governmental models. They point out important implications of such approaches for trade and competitiveness, especially if nations impose border adjustments based on carbon emissions from production processes.